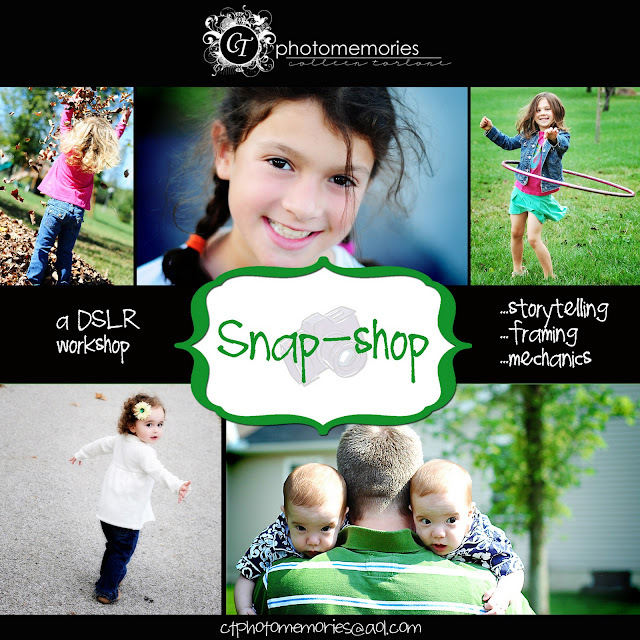 This SNAP SHOP is what you need! If you have invested the money into a DSLR, you probably are getting a good idea of what type of pictures you are attracted too...and they have something to do with the crispness, clarity, bokeh-blurry backgrounds, and countless other things that make an image POP! It has to do with the settings or "mechanics" of the camera...and although green AUTO is a good place to start, figuring out words like shutterspeed, aperture and ISO can make a HUGE imact in taking your photography to the next level! 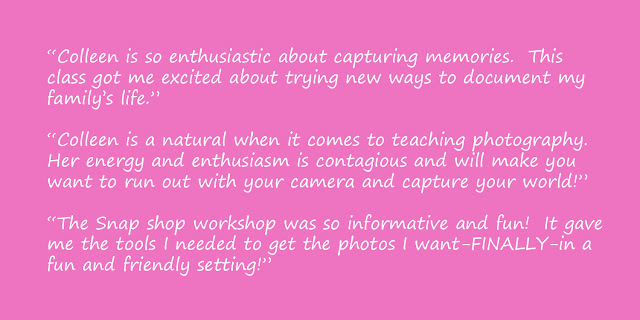 Directly after this workshop, the CLICK-IT workshop is available...it's the very next step to taking your photos, enhancing them to print worthy and also changing some into works of art! Let's face it...even though I've taken time to learn my camera and it IS my goal to have my SOOC (straight out of camera) photos be perfect...﻿when my girls come running in from outside with something "cool" to show me and I'm up to my elbows in potato peels...I'm not necessarily thinking about correct exposure and I just grab my camera and run! 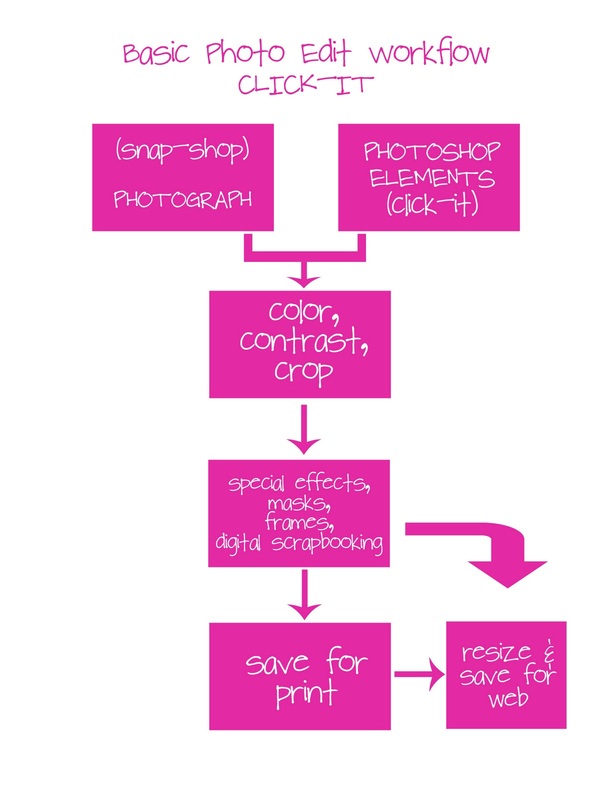 CLICK-IT is Part 2 of the photography workshop series...This is when you take everything you've learned from the SNAP SHOP, have a bunch of images and choose what and HOW to print them! 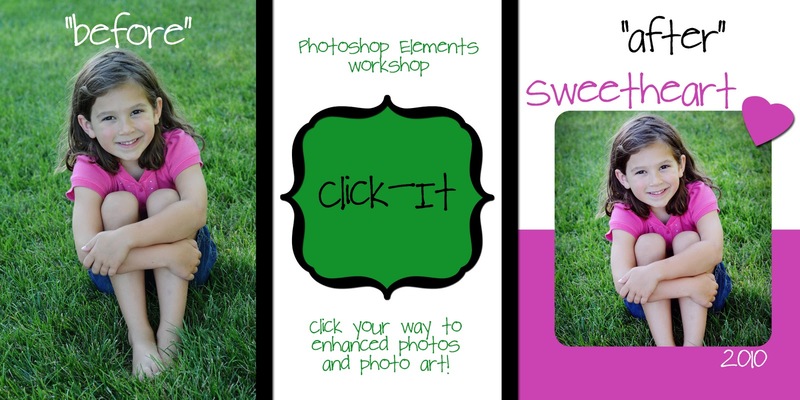 ***Click It is an introductory class to photoshop...more advanced classes can and will be offered at a later date for those desiring even more in depth knowledge of photoshop elements, such as clipping masks, running actions, texturing images, etc. Please be sure to contact me if interested. Class size for each workshop is limited to a maximum of 14/minimum of 5. Spots are given on a first come first serve basis. Please email at ctphotomemories@aol.com to save your place and indicate if you are attending one or both classes. Payment is due by May 28th. Once Classes are full, a wait list will be created for a future date and/or replaced by emergency cancellations prior to May 28th. I would LOVE to come to one of your camera/picture editing classes. I will be wrapping up my school year so can't make this one. Oh...and I got 4 (yes 4) bouquets of flowers for my birthday. I tried to take pictures like you and Sara would...just got frustrated with my camera. I just kept taking pictures hoping to get the ones I want for the birthday page I have created in my head. I need to load them into iphoto and work with them!